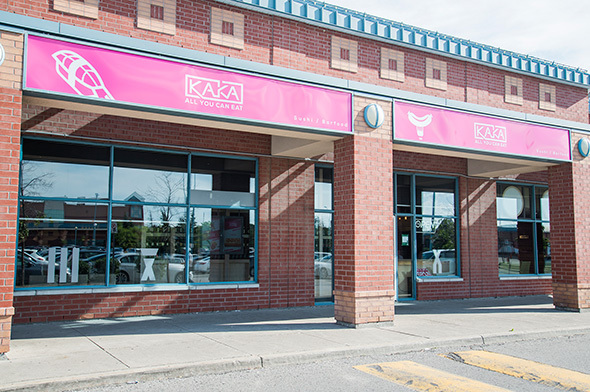 KaKa All You Can Eat offers one of the best AYCE sushi experiences I've ever had - just don't let the price tag scare you away. The Markham restaurant costs more than most AYCE restaurants - $24.99 for weekday dinners and $28.99 for weekend dinners (no lunches yet) along with a special $9.99 price for children ages 4 to 8. 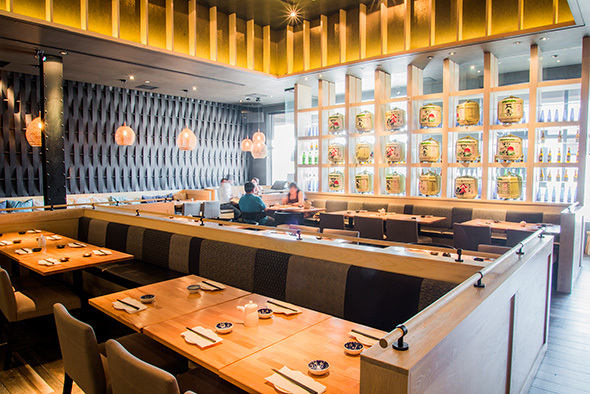 Along with the price, what sets KaKa apart is both its modern decor and the quality of its fish. Dark colours, comfortable seats and semi-private booths predominate the space. We start with the tuna and salmon sashimi which were were thickly sliced with thoughtful garnishes you just don't see at the cheaper places. 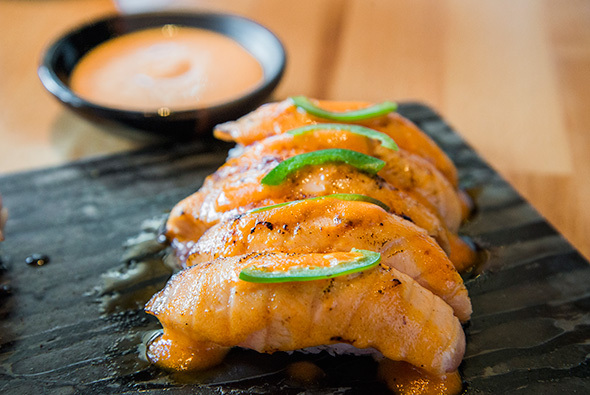 And whoever heard of an AYCE restaurant serving aburi (blowtorched) sushi. You won't find this at Aji Sai . 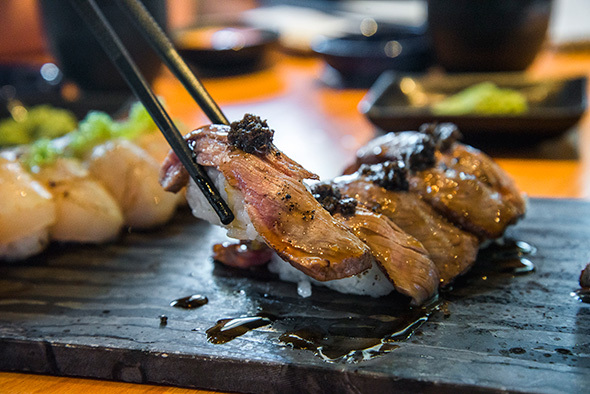 We instantly devoured the beef tataki with black truffle along with the spicy salmon. 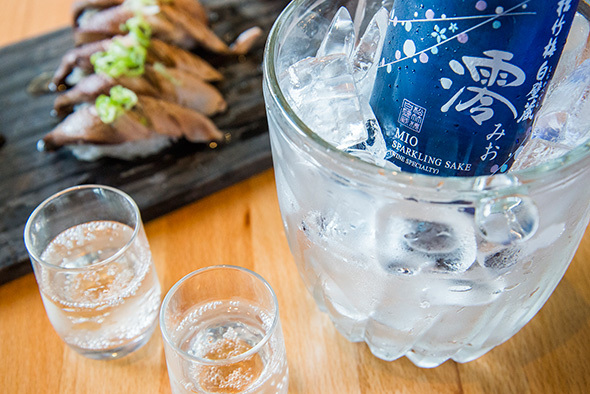 Make sure to order the Mio Sparkling, a light and fresh sparkling sake beverage which goes down well with the food here. 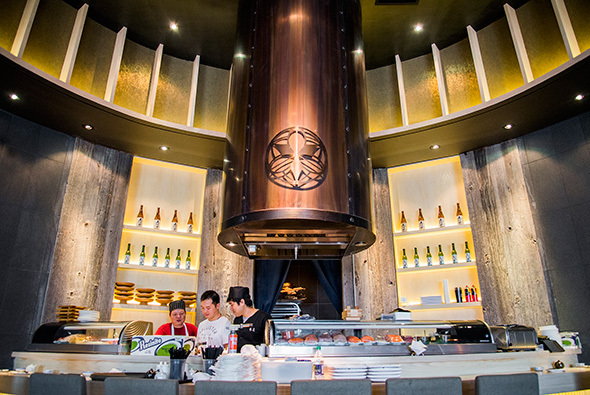 KaKa also provides a large selection of Japanese dishes beyond the raw fish offerings. I recommend the lamb skewers, marinated beautifully with spices reminiscent of the kind you would get in Western China (Xinjiang) cuisine. 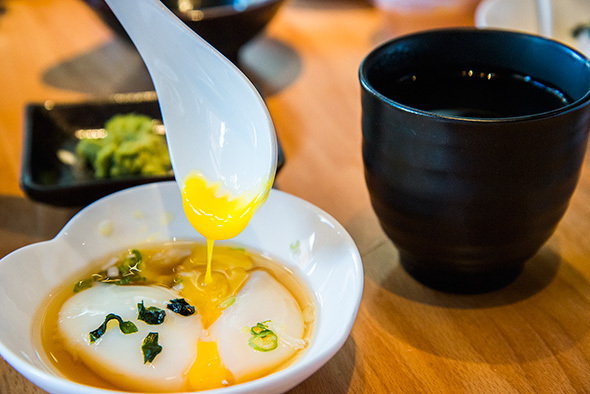 Another interesting dish worth a try is the spray egg, a poached semi-cooked egg immersed in a delicious semi-sweet broth-like sauce reminiscent of miso soup. It's probably one of those "love-it or hate-it" dishes, and while the egg taste was a bit strong, that's kind of the whole point of the dish. Also interesting is the oshizushi, or compressed sushi. 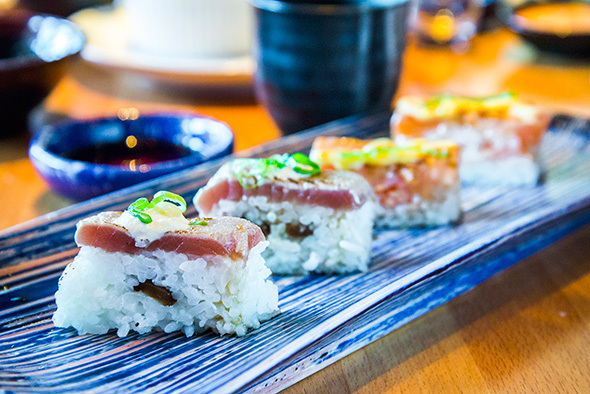 The flavours are bold and the whole thing feels like a denser version of your traditional sushi, and is definitely worth ordering. Feeling up for something a bit adventurous? make sure you sample the baked oyster. Lovingly smothered with cheese, the dish beautifully retains its trademark oyster taste but with a flavour that is less overpowering. It ain't Sansotei but the ramen here is worth a taste. 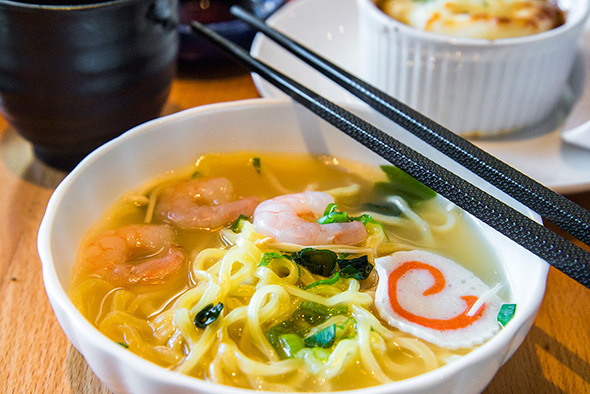 The broth is sufficiently salty and the noodles have just the right about of chewiness. 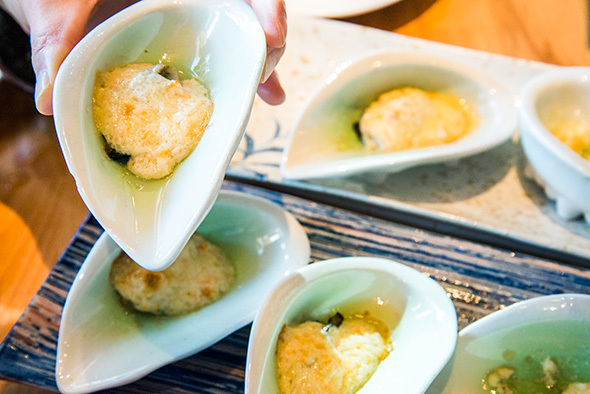 As a decadent side dish, you can't go wrong with the tempura scallops. 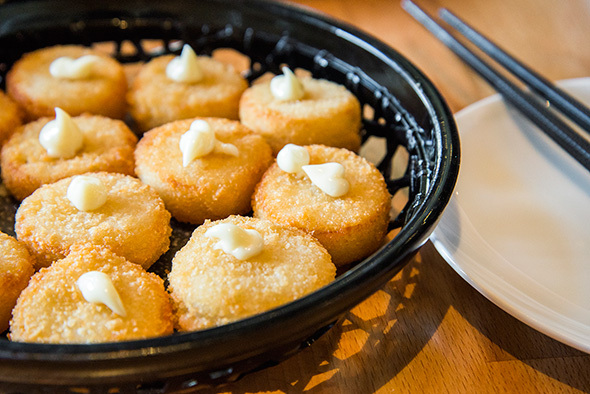 While calling the batter tempura is a bit of a stretch (it is more like breadcrumbs), the scallops are fresh and succulent - the little dollop of mayo on the top of each one added a touch of welcome creaminess. Make sure you save room for dessert. 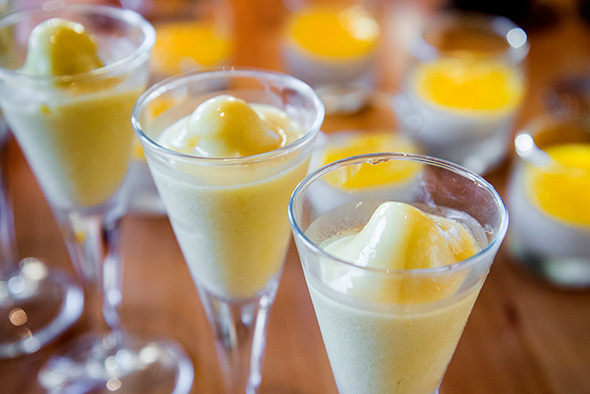 A far cry from the usual "do I want mango or green tea ice cream?" decision that you normally make at AYCE places, Kaka boasts an impressive collection of hand-made treats ranging from crĂ¨me brulee and blueberry cheesecake to unique offerings like the mango lychee slush and a velvety smooth cappuccino custard cup. 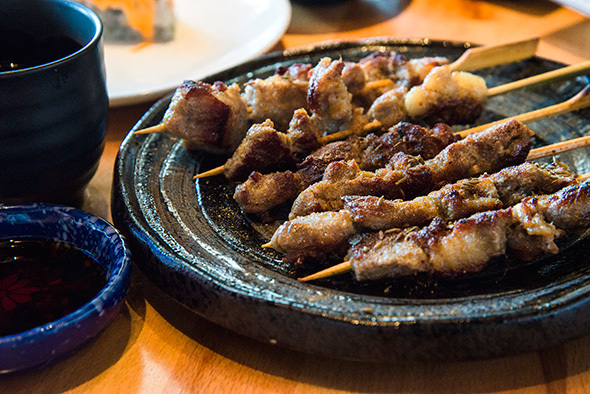 It's rare to get an AYCE experience that reminds you of a proper sit-down restaurant. Despite its rather awkward name, the food quality and overall ambience make it a great place to hang out with friends or even *gasp* a date.. After all, how often can you say that you had a romantic dinner....at a KaKa? (I'm here all week, try the veal).